I have always loved the use of animal prints in both fashion and interiors; but I think people are often faced with issues in finding the right balance between being a little too Cruella de Vil with their animal prints and getting it spot on (no pun intended). In the last few decades animal patterns and furs stopped being associated with the glamour of old Hollywood and instead began acquiring a bad rep; partly to do with our regard for our furry friends and also their overuse by less than A list celebs. Fortunately there are some great animal prints and faux furs available that provide a perfect addition to glamorous and quirky interiors and won’t put you on the wrong side of PETA! Christian Lacroix wallpaper is sporting some spots and stripes this season via abstract leopard and tiger patterns. Available in multiple, vibrant colours, this is a thoroughly modern way to play around with prints; so if you’re worried about your interior looking a little dated, these papers deliver contemporary living for the brave! If you want to create a true animal print effect then the Santo Sospir wallpaper in Dore could be the one for you but if flamboyance isn’t your thing and you still want an abstract approach to animal patterns, then the pattern handily comes in a beautiful creamy colour as well. This would give any wall a hint of sizzle without being overly explosive. Osborne & Little’s 2015 Spring Collection is also seeing an array of animal prints that certainly bring the ‘wow’ factor. 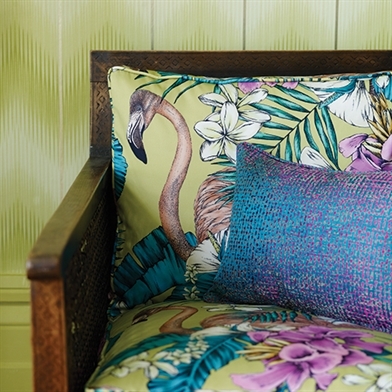 This python fabric comes in two styles; a natural, and a wildly vivid colour scheme (see below). It could be the perfect finishing touch to a clean-cut room that makes your interior design skills stand out from the crowd. For a touch of Hollywood glamour, Osborne & Little’s Kesi Velvets in Pantanal and Pardus could be the icing on the cake for your home. Whether you want to feature the fabrics in a few cushions, a sofa pouffe or even go the whole nine yards and use it for an entire sofa, these velvets give a warm, vintage feel to any home. To me, a fun way to play round with animal prints in your home can be achieved by using zebra stripes. A friend of mine has always displayed two large zebra striped sofas in her living room, paired with lime green and bright orange cushions, and I have always felt that this setup matched her wacky personality perfectly. Jonathan Adler has some great rugs and cushions that adopt zebra motifs in a cartoony light-hearted way. Or for a more modest and elegant style, you could try a few fabrics from Swaffer’s Serengeti collection, which features a lovely, sophisticated zebra print. If you want to play around with your style then using animal prints and motifs to accessorise your home is a great way to do it. Animal prints are a versatile theme that have been used in different eras and countries, so whatever your style there’s an animal print that will be perfect for you. They say a leopard can’t change its spots, but your home style certainly can!